At a lunch with the leaders amid the UN General Assembly, Trump mused about the vast continent’s opportunities and challenges. “Africa has tremendous business potential,” he said. “I have so many friends going to your countries, trying to get rich. I congratulate you. They’re spending a lot of money,” he said. South Africa’s Jacob Zuma and Nigeria’s Muhammadu Buhari were among the leaders at the lunch. This so called white leaders dont even respect black leaders.check the table settings you we notice black leaders were put at the end instead of mix them.partiality. What do you expect? 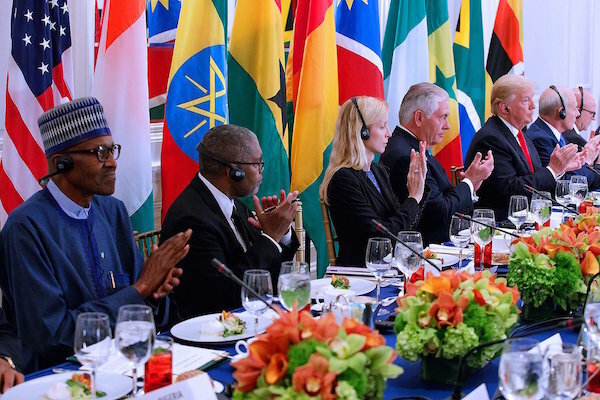 Would you have expected them to place Buhari at the center of the table? He is a tyrant and a dictator.